ABOVE LEFT, CENTER: Hurricane Rita tears apart a Dairy Queen and a Wendy's sign in Port Arthur, Texas. ABOVE RIGHT: This gas station canopy in Vidor, Texas went airborne, flipped over and landed across the road from its footings. 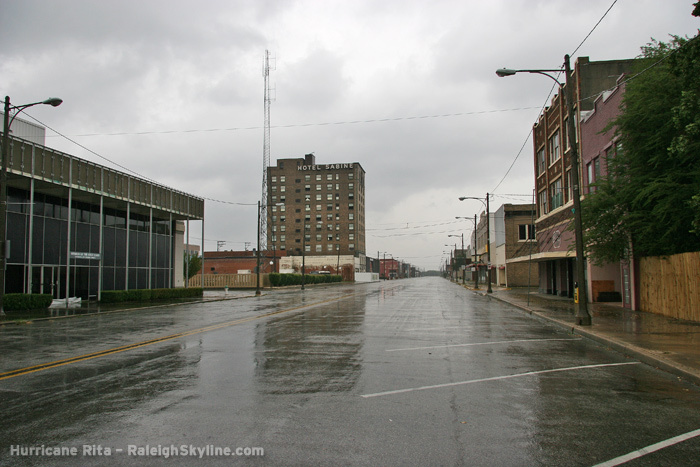 MORE DIGITAL PHOTOS: View photographer Matt Robinson's imagery from Hurricane Rita on raleighskyline.com. BEAUMONT - PORT ARTHUR, TX - Hurricane Rita made landfall near the Texas-Louisiana border early Saturday, bringing widespread damage, power outages and flooding to both states. 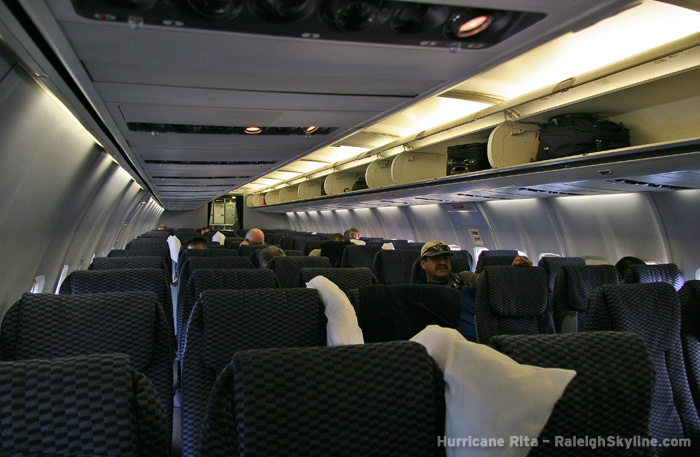 Below is a log of our trip to Texas to cover Hurricane Rita. Thumbnails may be enlarged by clicking on the appropriate thumbnail image. We got the call at noon on Thursday (September 22) that we would be needed to assist in providing on-location coverage of Hurricane Rita's landfall, which at the time was forecast to be less than 48 hours away. I immediately started packing gear and called Matt in Raleigh to start making his flight arrangements to Houston, our initial starting target. After a stop at Wal-Mart for over $150 in food, water and supplies (enough for both of us for five days), I was finally heading west on I-64 by 1:30PM EDT. Matt's plane was to leave Raleigh at 6PM EDT and arrive in Houston at 8PM CDT, at which time he would pick up a rental car and drive to a hotel for the night. We planned for me to arrive the next morning, return the rental car, and then both of us continue on to our coastal target in my vehicle. 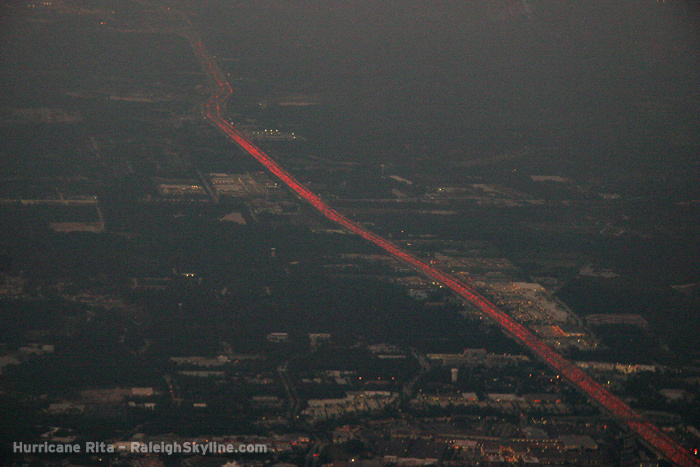 As Matt arrived in Houston in a near-empty plane, he got an amazing aerial view of the endless evacuation traffic on Interstate 45 heading for Dallas. Meanwhile, I continued the long trek south and west, stopping a few times for naps in Mississippi and Louisiana. I finally arrived in Houston at noon on Friday, and Matt and I headed back east to begin shooting video in the town of Port Arthur. 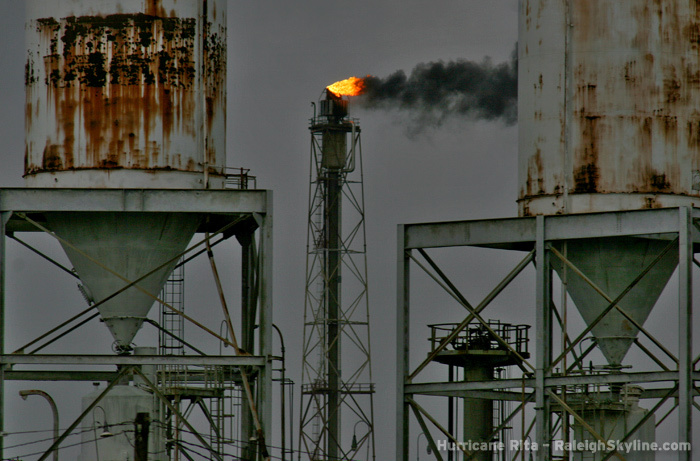 Rita's track had shifted toward the Louisiana-Texas border, so we opted to stay in the Port Arthur-Beaumont metro areas of coastal Texas to attempt to experience and document the heart of the storm. We arrived in Port Arthur just as the first outer bands of Rita began to affect the area with light rain and gusty winds. 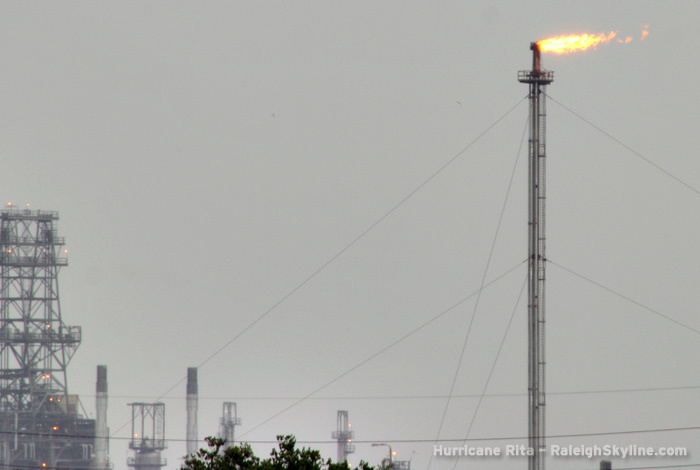 We got a few shots of the oil refineries' flaming stacks in the wind before crossing the Sabine Lake bridge for some shots of the water, now beginning to look choppy with whitecaps. Traffic lights were swaying hard in the wind. The high bridge allowed for stronger gusts of wind to rock the car. This would only be the beginning of what Rita had in store. We moved into the residential and business districts of Port Arthur to gather more 'before the storm' footage, finally ending up in the deserted downtown area. It was surreal and disheartening to be seeing and photographing what would be the last images of the town still intact, knowing that certain devastation was only hours away. At 5PM, we took a break from filming to do some necessary video editing, then resumed our expedition by 7PM. As the daylight faded, Rita's outer core was starting to affect the town with increasingly higher gusts and heavier bursts of rain. It was apparrent that Rita was ready to begin inflicting her first damage to the town of Port Arthur. As winds accelerated past 50mph, signs and gas station canopies were beginning to rock. Trees strained as the wind audibly roared through their branches. Then, the first power line arcs ('power flashes') began to burst in the sky as the flailing energized wires touched. We encountered an intersection in the Port Arthur neighborhood of Nederland with several objects of interest in view. A gas station canopy wobbled in front of violently swaying trees. Signs for a Domino's Pizza and an Advance Auto Parts store bowed in and out as the winds pummeled. A telephone pole, top-heavy with transformers and wires, swayed back and forth in the gusts. A Dairy Queen restaurant was showing signs of weakness in the wind. This intersection seemed to be an ideal spot to document Rita's inital effects, so we parked on the downwind side of a large building and set up the cameras. Soon after, the Dairy Queen restaurant began to fail piece-by-piece. First, the metal sheeting on the underside of the drive-through canopy exploded outward and began peeling back. Then fluorescent light fixtures began to rip loose from the roof overhangs, the bulbs crashing to the ground and shattering, their pieces carried away by the wind. Overhang panels began to fall and sail away in the wind. Roof sections bent upward, ready to fly off at any moment. Increasingly frequent power flashes from arcing lines lit up the sky with blue-green glows, and soon the circuits at our intersecton began losing power. With night falling and power failing, it was getting harder to find sufficiently illuminated locations to shoot video. The Dairy Queen, while still undergoing a progressive destruction, was no longer very visible to our cameras due to the loss of power and surrounding lights. We decided to move on to find other locations to document. With power and light getting harder and harder to find in the immediate Port Arthur area, we moved north to the shopping/retail district just outside town. Many large chain stores, hotels and fast-food restaurants in this area still had power, so we stayed here for a little over an hour to continue our documentation. We found a damaged Wendy's sign that had already lost one of its panels, and it appeared that the other side was about to fail. We pulled up just in time to catch it falling to the ground, breaking into pieces on the way down. We decided to try to get one last round of shots of downtown Port Arthur, but as we approached town, nothing but total darkness was visible ahead. The entire town appeared to be without power. With no light, there would be little that our cameras could see other than what our headlights could illuminate. So, we said a final goodbye to Port Arthur and headed north toward Beaumont. The drive to Beaumont was slow but steady, dodging tree and sign debris on the roads. 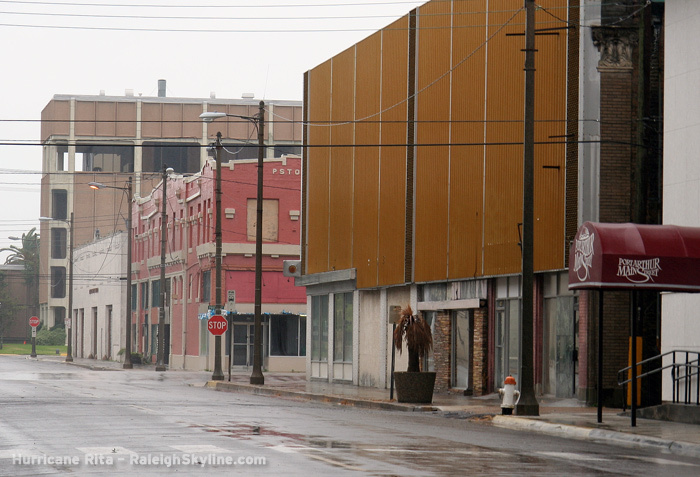 Much of Beaumont still had power when we arrived at midnight, so we ventured to the downtown area to begin shooting. By this time, I was beginning to feel severe effects of sleep deprivation, a common side-effect of covering hurricanes. Since 8:30AM on Thursday before I left Charleston, I had managed less than two hours of sleep in a 40-hour period. Despite the approaching eyewall, I stopped in downtown Beaumont to take a brief nap while Matt continued shooting. However, I had no more stopped the car when winds began to suddenly increase from 60mph to near 75mph with gusts approaching 90mph, enhanced by their funneling through the buildings in the downtown area. The resulting burst of adrenaline snapped me back to alertness, and I was outside setting up the camera in minutes. The wind racing down the city streets was a sight to behold. A lone construction barrel was tossed and rolled about in an intersection. More power line arcs filled the sky. It was obvious that Rita was getting ready to come ashore. Rita continued to turn up the intensity. Wind and rain roared down the streets, rocking traffic signals and bending trees at nearly 45 degree angles. Airborne debris could be heard crashing into the streets along with the sounds of breaking glass, and a nearby building sign blew out with a loud bang. Satisfied with the shots we were able to get downtown, at 2AM we decided to head to a hospital parking garage that we had found earlier. We knew Rita's even more intense eyewall was approaching, and wanted to be in a safe place that would provide protection for both us and our vehicle. On the way to the parking garage, we passed a fallen power line - still energized - loudly arcing to the ground with bright orange and blue flames. Finally in the safety and security of the large steel-reinforced parking garage, my adrenaline-enhanced alertness ran out. I could not go on without getting some sleep, despite the increasing winds outside. It is not unusual in this line of work to sleep through the middle parts of a raging hurricane, after sometimes days of driving and repositioning! Despite the howling winds, banging and falling signs inside the parking garage, and car and fire alarms going off, I was able to sleep for close to 90 minutes. Thankfully, Matt was doing better in the area of sleep, having got a night's rest in Houston on Thursday. He was able to keep shooting and wake me up around 3:30AM when the height of Rita's eyewall roared into Beaumont and over the parking garage. Rita's eyewall between 4AM and 6AM was nothing short of awe-inspiring. A constant, steady flow of wind and rain rushed by at more than 100mph. By now, power was completely out in Beaumont. Thankfully, we had light at the hospital, which was running on generator power. A MSNBC news crew broadcasting below us was also providing some extra light to capture some video of the scene. Trees reeled from the sudden gusts of 105mph winds, and the ground level around the hospital slowly began to flood from the relentless rain. As Rita's eye passed just a few miles to our east, our winds quickly shifted from the north to the east. We had to move the car from its once dry location now that the rain was coming in from another direction. Finally, our winds began to slow somewhat, and it was apparent that we had captured just about every possible angle from our vantage points in the parking garage. We managed to sleep until daybreak. As the sun came up, winds were much calmer. We looked outside to see that our parking garage was surrounded by water. It appeared we were going to be stranded for quite some time, but one by one cars began to venture out into the water, gingerly at first, then more confidently. Seeing that vehicles were making it through the flood without problems, we decided it was safe to leave. We slowly made our way through a two-block long stretch of road covered by 6 inches of water. Finally out of the flood, we stopped at several spots for damage and aftermath shots. Trees were down everywhere, with some smashing down into houses and buildings. We initially started heading east on I-10 intending to take Interstate 55 north through Mississippi toward home. However, the increasing damage as we headed toward the Louisiana state line made us change our minds, and we amended our route to Houston and north on I-45. We turned around near Vidor, stopping numerous times to get damage shots. Each time we stopped, we seemed to see something more and more outrageous. A church roof was ripped open. Billboards were toppled. RVs and full-sized camping trailers were flipped upside-down. A gas station canopy lay upside-down, completely across the road from where it had been standing - obviously going fully airborne after it ripped from its supports! On I-10 west of Beaumont, damage began to taper off, but not before we spotted more sign and billboard damage, collapsed brick facades on buildings, and toppled high-tension power lines, their wires draped across the lanes of I-10. Amazingly, we only suffered one flat tire from all of the debris on the road in Beaumont, which a can of fix-a-flat quickly remedied. We made it to the ghost city of Houston, eerily devoid of traffic and people. We found the Holiday Inn downtown open with rooms available, and checked in for the night. The hotel was half full of victims from Hurricane Katrina in Louisiana. After doing some final video work, we crashed at 5PM and finally managed to catch up on much-needed sleep. On Sunday, we left town to begin the long trek home. By mid-morning, the southbound lanes of I-45 were packed with evacuees returning to the Houston area. As we continued north, resources such as fuel and food became more and more plentiful. By the time we reached Dallas, conditions seemed to be back to normal - we had made it out of both Rita's immediate damage zone, and her more extensive gas and food shortage zone. After two more days of relaxed-paced travel with stops in Little Rock, Memphis, Nashville and Lexington, we made it back to Charleston, West Virginia on Tuesday night to call it a successful expedition. 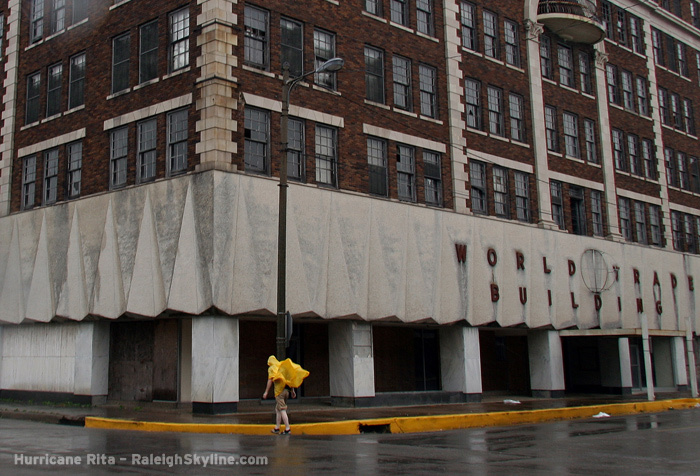 MORE PHOTOS: View photographer Matt Robinson's imagery from Hurricane Rita on raleighskyline.com.